Get a clear case, there are plenty of good ones. I'm using a Moko clear slim case right now, I will probably get something a little more rugged for travel. Don't do it!!!! Haha it is so pretty though. What color you get? If I didn't I would be very PO right now and my girl's S10 would be up for sale. It fell out of my vest pocket when I was detailing my CivicX. Like I said it's only naked at home. My S9+ got so many dents and scratches, I felt bad for it! I've learnt from my mistakes and now I used the case that came with my S10+ and factory screen protector! The ceramic back is pretty tough. I saw CNET's drop test for the cl0 while they showed impressive durability, drop after drop, I'm not taking any chances, just loves these phones right now. I'm playing with fire using a spigen thin fit. Its not slam boy certified, but protect s the back and sides from scratches or slight drops. Couldn't imagine going naked though. One drop and the phone is toast. I have the Mimic case and it is the one that I use when I'm going out and don't want to go naked and don't want to use my sleeve. It has horrible reviews online but the one I received was perfect. It has a very slim profile and is almost like not having a case which is why it's my backup. I have one on another device that I've been using for 6 months with no issues after being dropped quite a few times. 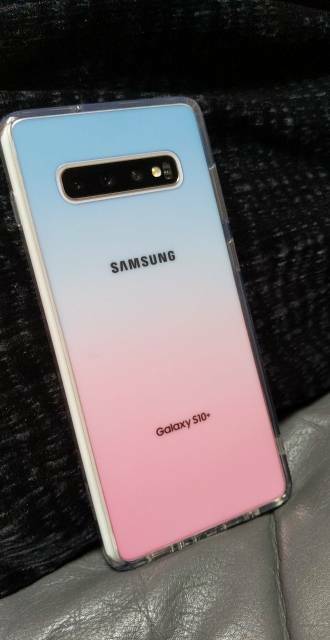 Going back my daughter had one on her iPhone X it was a solid colored version and the coating would get scratched very easily. I'm not sure they still sell those but I don't see it available for the S10 and I don't recommend that one. I have a clear one and I also have a tinted one. The tinted one is nice but only with certain colored phones. See the picture below... it's on a Ceramic White. I'm not sure how it would look prism white or other prism colors. I just wish it came in more tinted colors. My daughter thinks it's too feminine looking for me but I'm okay with it. I also like how it adds grip to the phone even though it's a glass back. The glass back feels better than having it in clear TPU and doesn't yellow. The TPU sides give it a nice little grip compared to running naked with it. The metal sides on the phone are pretty slippery. That's nice. I have the clear one because I didn't want to cover up the ceramic white. I don't use it often but I hope it doesn't scratch easily. I don't think it's too feminine; nothing wrong with a little color. That's nice. I have the clear one because I didn't want to cover up the ceramic white. I don't use it often but I hope it doesn't scratch easily. I modified my post slightly since you replied just to talk about grip. Like I said earlier, I have one on another phone and it's held up quite well. After 6 months there might be a couple of fine scratches that you have to look for to see. I'm pretty careful with it and try to avoid keeping anything in my pockets that would scratch the screen or the back of the case. I also have a clear in case I feel like switching off. I always rock my phones naked, generally sell them before they get any real damage and usually have insurance for price of mind. I am generally a Pixel/Nexus phone user for Android and an iPhone user and never have issues. However, I've had the Galaxy S6, S8+ and now the 10+, for some reason, all of them seem to scratch very easily. The display usually gets surface scratches and the glass body the same. I've had the S10+ since launch and I already have a chunk taken out of the metal frame and some scuffs on the display. I've had the iPhone X and XS, every pixel version and none of them have any of this after months of use, what's up with Samsung! I work from home, my phones are always babied but for some reason, I always end up with a scuffed Samsung phone. How did you get a chunk taken out of the frame? Yep. That's why I'm very particular about others handling my phone. If they damage it, they're not going to want to pay for the damage. My phones don't have scratches and dents..and nicks. Honestly, no clue. There is a big divit in the metal frame, never dropped the phone, never in a pocket with keys or anything like that, sits on a charging stand most of the time. No case, only have a gel one around for hazardous situations. I am lucky to work in an office so day to day I do not really need one. I've said elsewhere on here that cases push a lot of plus sized phones the wrong size of bulky for me so if I had to use one I'd choose a different phone. I probably would not go flagship either if I had to cover it up, a part of the flagship experience is the aesthetics for me. I recognise the risk and have had one of 2 battle scars over the years and will no doubt have more but I am careful and I usually have insurance too. My iPhone Xs max had a scratch on the back after 2 days and I was practically handling the thing with velvet gloves, sometimes it just happens. My Xs max has another small scratch, hard to see but I have no idea where it came from either. My S9+, and Note 9 and even Pixel 3 XL were all sold on immaculate and pretty much as new so it does vary from device to device. yup, I watched that review ! I've decided to try it without the case. For some reason S9+ black version was a smudge magnet, this ceramic black version is doing much better ! This. Just. This. I absolutely canna stand any kind of blemishes on my devices. Dust is about as much as I can tolerate. It's a sickness, I imagine, but it is what it is. When I see someone using g their phone with scratches, nick's, or heaven forbid, with the screen cracked I feel both terrified and envious at the same time. ...envious that they're at such peace that such horrid damage doesn't bother them...and terrified that my phones could be such afflicted. Like I said, it's a sickness. libra89 and mach1man like this. I can relate. I have no idea how people can just casually use a phone with a cracked screen.